When you need a brand that is recognised, stable, and proven, there is no better known provider than BT. Their cloud phone system is not a franchise – BT manage the phone system and the core network themselves. Online portals are available for self-configuration of the product with intelligent auto-configure, offering a saving on setup fees and allowing businesses to work to their own timescales. Free calls and free handsets completes a package that meets the needs of all sizes of business today. Take a closer look below to see what BT’s cloud phone system has to offer in unified communications, HD voice, call logging, call handling, mobile integration and web collaboration. This feature allows instant messaging and presence from a desktop or smartphone application (depending on the licence) that enables voice and video calling through the inbuilt softphone. The feature set includes access to contact lists and feature management options. Intended for the user who is regularly mobile and woks between different locations, including customer’s offices. The Mobility User licence features all the benefits of the Advanced User licence plus a suite of softphone applications that work on smartphones; still using a single business telephone number when away from the primary phone. This pack also includes a hotdesk feature. 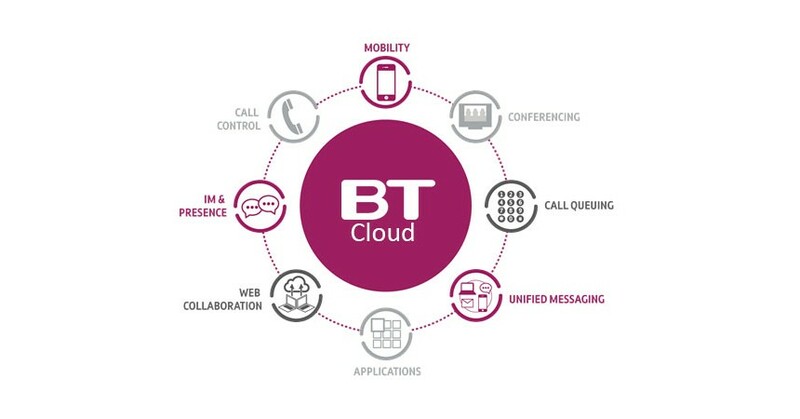 BT’s cloud phone system is built on Broadsoft’s market-leading Broadworks platform. Broadworks offers massive scalability and geographic redundancy; designed specifically to offer carrier-grade availability with no single point of failure. Broadworks has been commercially available since 2000 and is one of the most popular hosting platforms available today. Fully scalable, risk free, pay-as-you-grow service with handset costs and call charges included in the package; plus simple setup with automatic configuring; all of which results in simple cost management for your business. There are no major setup costs, upgrade costs, or surprises; just a straight forward complete solution that flexes as your company does. With BT you can buy in total confidence. Get in touch today to see the system in action and step into the latest VoIP technology.